Student: Professor! That man claims the earth is 6,000 years old! Professor: So? Just use your head and don’t concern yourself overmuch with what other people think. Student: But he says the fossils in the mountains were put there in a flood! Professor: Evidence suggests that they were not. Professor: A million people can call the mountains a fiction but it need not trouble you as you stand atop them. Student: But he believes the silliest things! Professor: The universe doesn’t care what you believe. The wonderful thing about science is that it doesn’t ask for your faith, just for your eyes. Student: But he’s a US Senator! 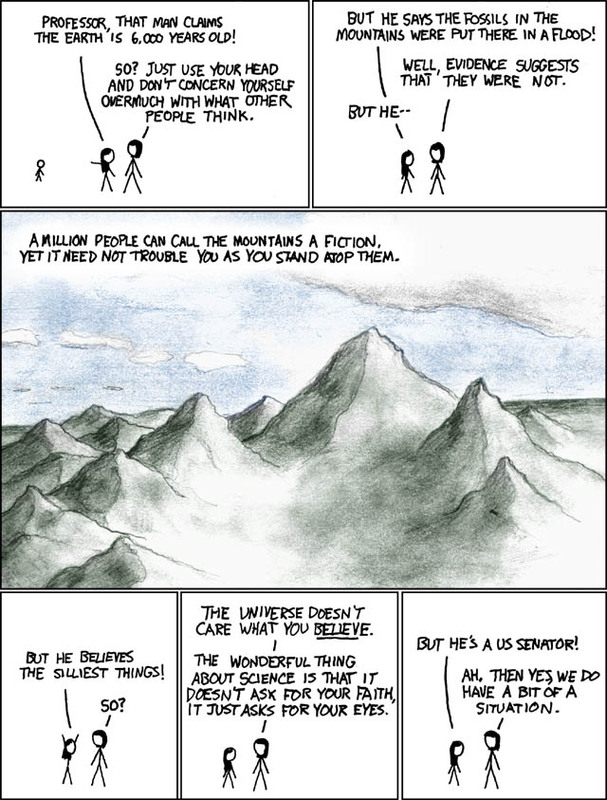 This comic was linked in a Pharyngulite discussion of this week’s webcomic from Tom the Dancing Bug, referencing some very silly things said about global warming recently by current US Congressman Steve Stockman (R-Tex), who is inexplicably a member of the Congressional Science, Space and Technology Committee. I have this one for you, from everyday feminism.